Thursday President Boot, $199 – Thanks to Thursday Boots for believing in Primer's mission that well-made style can be affordable and by sponsoring us. I spent my early and mid-20s wearing sneakers, running shoes, and (occasionally) dress shoes with every flavor of outfit. I wore hi-tops on dates and black dress shoes on job interviews. When I started working in a creative industry, I quickly slid into a very Dad Jeans look: trainers + pants. It wasn’t until about three years ago that I figured out what was missing from my look: a pair of brown leather boots. Through Primer, I was introduced to Thursday Boot Company and I invested in a pair of brown Wingtips. It was love at first smell – I still remember the rich, nutty leather scent when I pulled them out of the box. I wore them at the office. I wore them on dates. I wore the same pair at my wedding. My pair of brown leather boots has become…essential. 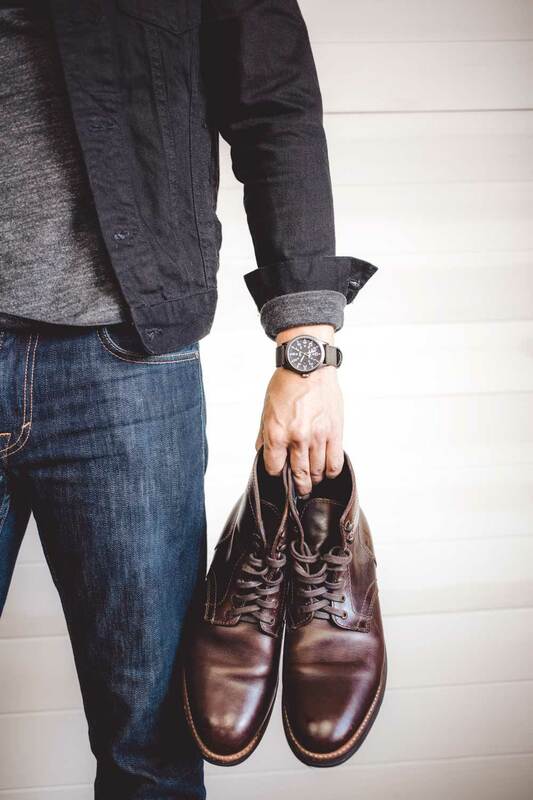 “It” is all the ways a pair of good brown leather boots lend polish, maturity, versatility, and ease to your style. It’s as simple as this: if you want to start dressing better, high on your list should be getting a pair of brown leather boots. Few items can be worn both casually or dressed up. For those in the know, it’s become a way of life. For the rest of us (including me, until pretty recently), maybe it isn’t so obvious. So we’ve crafted an ode to the humble, amazing brown leather boot. If you already own a pair and rock them on the reg, read on for a celebration of all they bring your life. If you don’t own a pair, here’s a lighthearted (but deadly serious) look at why you should get a pair. Life can be unpredictable. That’s a good thing. Unpredictable means a spontaneous Wednesday night date or after-work drinks on a Monday or meeting your friends at a restaurant on Thursday. The problem with social unpredictability is… you’re not always prepared for the opportunities life throws at you. What if that Wednesday night date happens on your gym night and you wore sneakers to work? It happens, believe me. I know. A pair of stylish brown leather boots fixes unpredictable. How? Because you’re literally always prepared for any social situation that might arise (with the exception of those last-minute black-tie galas). Fridays are typically the day to wear something nice and versatile to work because you have plans afterwards. Thursday Boot Company is literally named for the day of the week when you need to look nice at work and be prepared for an unexpected night out. 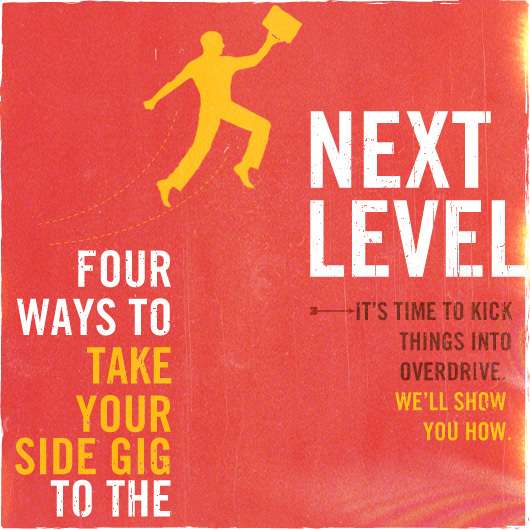 Being prepared for whatever arises is in the DNA of the company. And we love that. 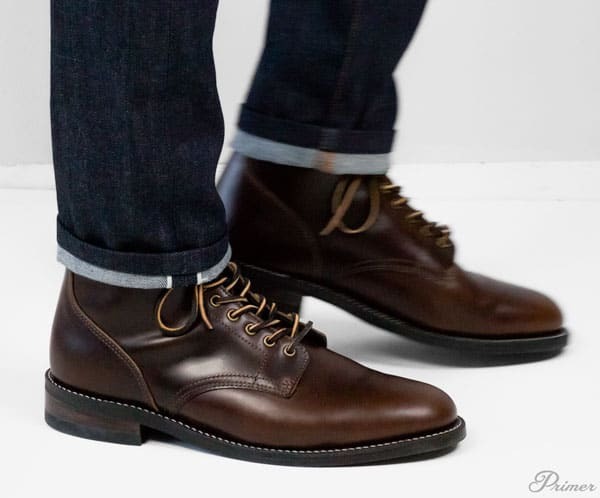 How versatile are good brown leather boots? Well, they serve the same overall purpose as a nice pair of dark slim jeans. 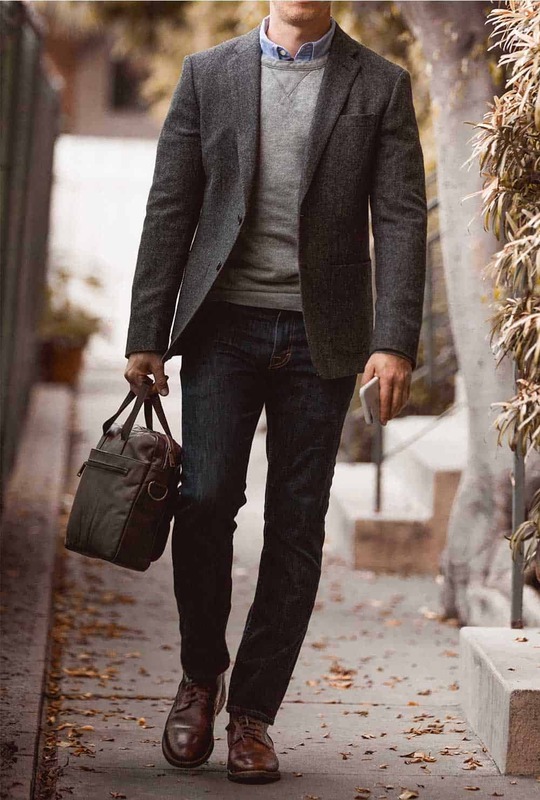 Think about all the ways a pair of well-fitting dark jeans can be worn: paired with a button-up and blazer for super nice smart casual outfit or way down with nothing more than a white t-shirt. If you work in a casual office they’re appropriate at work. If you go to school they might even be kinda… dressed up. Nice jeans are equally appropriate at a bar, concert, house party or job interview (in Silicon Valley/Alley). If you’ve ever visited Primer before, you know we love sneakers and chukkas and loafers and just about every footwear under the sun except sandals. 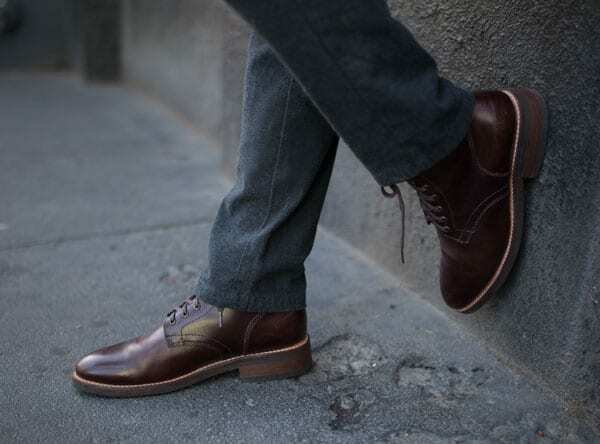 But no other piece of footwear adds more polish to your look without being overly formal than brown leather boots. Part of the added polish comes from the material: leather is a premium material that conveys durability, warmth, and a little touch of formality. And as long as you care for it properly, leather doesn’t lose its sense of polish as it ages … it simply accrues more character. 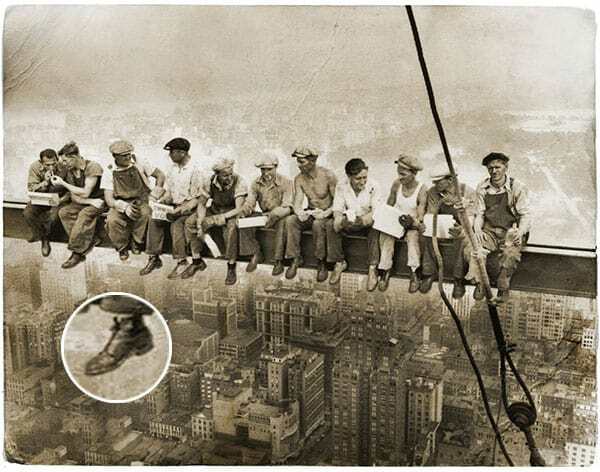 In centuries past, leather boots and shoes used to be the only choice for footwear in America. Sneakers didn’t start becoming daily footwear for kids until the 1950s, and decades later for the everyday, working adult. What are they wearing? A mix of leather shoes and boots (and you can bet they had them resoled instead of replacing them). The DNA of that time is still present in a good pair of brown leather boots. They’re rugged because that’s what construction workers used to wear. They’re elegant because senators wore them to work. Adding timeless elements to your look adds weight to your style. You’re saying to people: I don’t chase trends. I do value dressing well. I tried to be a sneakerhead for about 10 seconds in college. I got a few pairs of neon-accented hi-tops on sale and rocked them for a few years. There was a problem, however: I didn’t really pull them off. Why? Because colorful vintage sneaks demand commitment. They define your look by being bold and full of streetwear associations. Brown leather boots, however, are more chameleon-like. You can be in the process of defining your style and pull them off because they anchor your look in a non-showy way. Impressive without being flashy. You can have a well defined look and wear leather boots to complement it – because they don’t overwhelm what you’re already rocking. 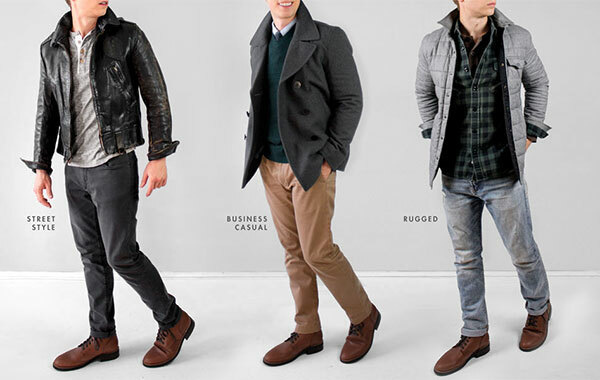 Whatever your style or what’s already in your closet, boots are easy to pull off. Any good leather footwear with Goodyear welts is theoretically water resistant…leather boots are actually wearable in the wet. Because they rise to the ankle bone, a well-made pair of leather boots gives you four-season protection that even the most premium pair of dress shoes can’t offer. It may seem like a small thing, but just wait until the next rainy night when you need to be dressed up – a big ol’ golf umbrella can keep your suit dry, but it’s nice not to worry about squish in your shoes, too. If you did a double take on this one, take my advice: don’t be pennywise and pound foolish. 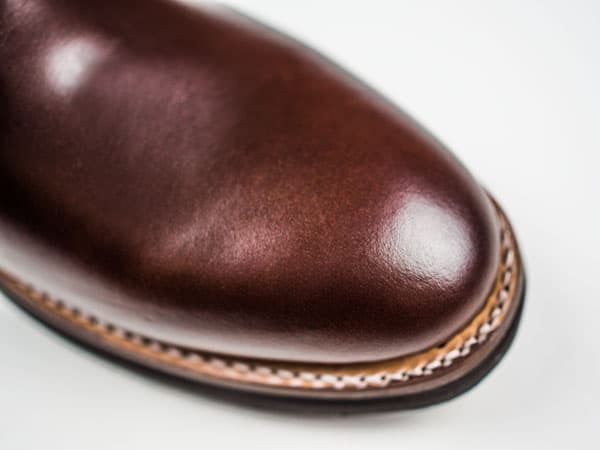 Yes, the upfront cost of a pair of full grain leather, Goodyear welt boots is (at least) twice that of boots that are constructed using glue and cheaper leather, but properly cared for they’ll last many, many years. 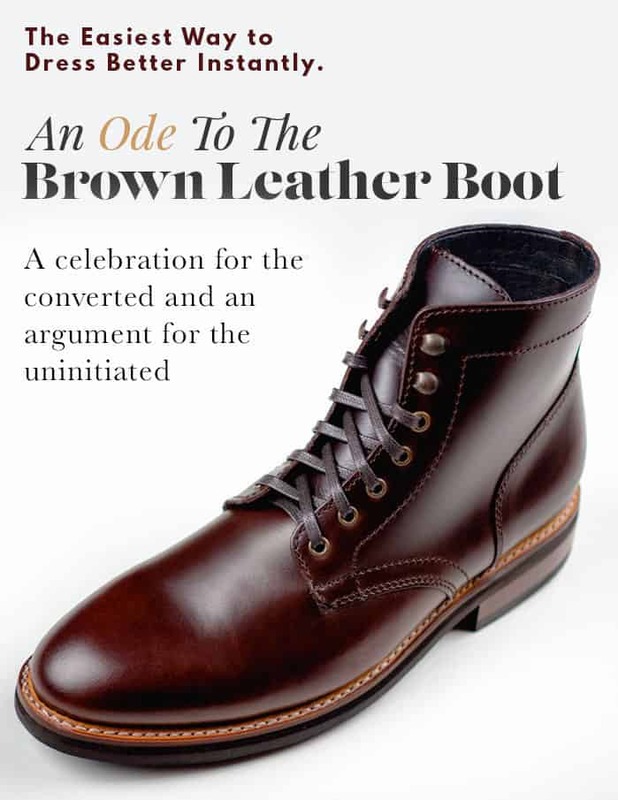 Just as the design heritage of leather boots reaches back to centuries past, the mentality of owning a pair can feel old-fashioned. In a culture moving inexorably towards disposable everything paying more for something you intend to keep for years is decidedly anachronistic. If you’re on the fence about investing in a pair of well-made leather boots, consider the annual cost over 10 years: Thursday boots – made alongside other premium brands from the same materials by the same craftsmen – run about $200. They’ll easily last you 10 years with proper care. Your annual boot cost? $20, or a buck sixty-six per month. What else in your life is as cost effective? Once I added my Thursday wingtips to my wardrobe, I learned all the lessons above… but that’s not what I was thinking about when I wore them. I felt more confident in brown leather boots. It’s as simple as that. I knew I looked great at work; I was covered in the event a social opportunity came up; I wasn’t worried about weather; I didn’t have to go shopping once a year because they fell apart; I knew they complimented my look without dominating it … my leather boots were there, doing work in the background, giving me a level of confidence in the style and function of my footwear that I hadn’t had before. So what are you waiting for? Don’t be late to the party – just get a pair and find out for yourself. How long have you been wearing brown boots? Let Us Know In The Comments! My Red Wing boots are one of the best investments I’ve made to my wardrobe! If you are not currently in a position to pay this much for a high quality pair of boots, I recently saw a technique to make a much less expensive pair at least look really good. I did it with a pair of Stafford Deacon boots and the difference was night and day as far as the appearance goes. The steps are as follows. 1. Get BLACK shoe polish and rub it all over the boots. Use a lot and don’t be afraid that you are being too heavy handed with it. This is not a typo. You want black shoe polish on your brown boots. 2. Once you have the entire boot coated, every bit of it including the tongue, let it sit for about 30 minutes. 3. Take a cloth and start rubbing the polish off. How much you take off depends on how dark you want the boots to look but trust me, you will be amazed at the difference in appearance. Hey John, Sounds like a cool way to add your own burnishing and add some character to cheaper leather! I can definitely see how that could help the Deacons, I have a pair and the leather is a bit too consistent in color. What about with a suit? I wore Thursday boots on my wedding day w/ a gray suit! It was more informal (no tuxes) but great for that occasion. The grass at the venue was a little wet and I didn’t worry about it. Cool. Any tips on caring? I bought one recently and Don’t know much about proper care. Thank you! Thursday Boots FTW. I wear them every week and agree about versatility. I only wore them with a suit once, though, at a wedding in the wet and cold catskill mountains. It worked well but I don’t recommend the look in a city. I have had my Thursday Presidents for a year or so and really like them. I am wondering what would be the best polish for brown leather boots? Awesome article! I came in the boot game late. But the old adage of better late than never is true! Love my Red Wing boots! Nothing like a nice pair of well worn leather boots! They seem pretty similar to red wing iron rangers in style at least? Might I ask where you got the checked shirt for the rugged look? Sure! Got it from Lands End a few years ago, has held up great. It’s a staple so I’m sure they have a version of it still. Where did you get the gray blazer in that first pic? Love it!